Breakfast may be my favorite meal of the day. And waffles are by far one of my favorite breakfast foods. That said, I’m not much of a morning person. I do my best work late at night, which results in me sleeping past the time many have already left for the office. Mornings are lazy around here, perfect for Lazy Morning Belgian Waffles. I recently got a new waffle maker after my trusty Big Boss Grill bit the dust. I loved that gizmo, it had six sets of plates to make everything from grilled sandwiches to baby donuts. And of course, waffles. When it stopped working and I pulled all of the plates out of the depths of the corner cabinet (you know the one, where bakeware goes to die…), I realized that I really only used it for making waffles. The other options were fun for the first couple of weeks after I bought it, but were rarely used. So this time around, I decided to go with a basic waffle maker. Then I pondered whether to go with a standard waffle maker or a thicker, Belgian waffle maker. And then I had to decide between square or round. Seriously, there was thousands of waffle maker options. I had no idea! After reading hundreds of reviews, I bought this waffle maker. Basic, Belgian waffles (round) and inexpensive. It’s been put to the task already, as you’ll notice in upcoming recipes. So far it’s been great and takes up far less space than the Big Boss Grill. All of this waffle talk had me thinking about my quest to find authentic Belgian waffles while in Belgium a few years ago, BGF (before gluten free). I spent three days expecting to find them on a restaurant menu. I asked one morning at a quaint countryside inn if there would be waffles for breakfast. The lovely hostess gave me a very perplexed look and said, “We don’t have waffles for breakfast here.” I thought she meant here, as in at that particular inn. The following day, in a small city in western Belgium, I asked at lunch if it would be possible to order waffles. “No, we don’t have waffles for lunch.”‘ I assumed I had missed them, that restaurant must serve them at breakfast. I was about to give up. The next day we met friends who live in Belgium for a stroll through a street fair and an early dinner. I was so excited, thinking maybe Belgian waffles are like funnel cakes in America, served at fairs and festivals. No. Wrong again. No waffles at that street fair, but some of the best French fries I have ever had. I finally mustered the courage to ask at dinner when exactly I would be eating waffles in Belgium. It was first suggested to me that I shouldn’t use the word “Belgian” when asking for waffles in Belgium. That is apparently a North American term. Then I was asked if I wanted Stroopwafels, the thin cookie-like waffle confection that is two waffles sandwiched with a caramel filling. I had seen these before, sold in packages in the grocery store. But no, that wasn’t what I was looking for. When I described what I desired, two additional varieties of waffles were revealed to me, light and fluffy yet small Liege-style waffles and dense, yeasty Brussels-style waffles that are larger. Around the dinner table, it was explained to me that waffles in Belgium are an afternoon snack. Not for breakfast, lunch or dinner, but a SNACK. I was right in hoping to find them at a street fair, as they can often be purchased from street vendors. There are also brick-and-mortar locations that open in the afternoons for waffle snacks. I missed them on that trip, but have since rectified that with a trip that included many afternoon waffles. Hopefully soon I will return and locate gluten-free waffles in Belgium! My Lazy Morning Belgian Waffles are a cross between Liege-style and Brussels-style waffles. They are light and fluffy like a Liege waffle, but large like a Brussels waffle. 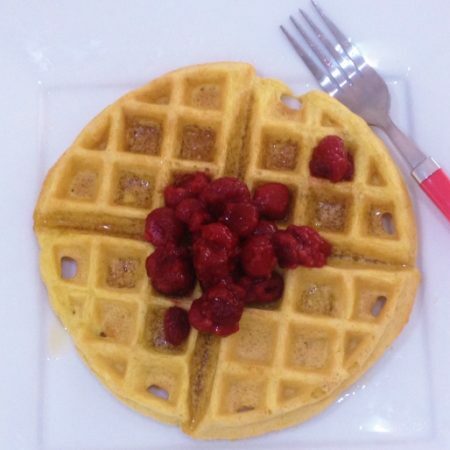 While best hot from the waffle iron for breakfast, they do make a delightful afternoon snack drizzled with a bit of honey. In a medium mixing bowl, combine gluten-free flour, baking powder, coconut sugar, guar gum and sea salt. Mix to combine. Separate four eggs, placing the yolks atop the flour mixture and the whites in a small mixing bowl. Using a hand mixer, whip the egg whites until the hold stiff peaks. Atop the egg yolks, add the milk. Stir until smooth. Add the oil and vanilla bean paste or extract to the mixture. Stir again to combine. Gently fold in the egg whites until mixture is combined. Preheat waffle iron. Spray with non-stick cooking spray of your choice. I use coconut oil spray. Top with maple syrup and fruit of your choice. Enjoy! Not a fan of waffles? You might enjoy my Lazy Morning Pancakes for Two, also gluten-free and dairy-free. 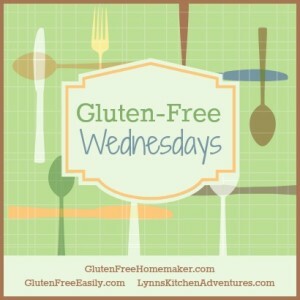 I’m linking this post up with Gluten-Free Wednesdays. Drop over for so many incredible gluten-free recipes! This post contains affiliate links. Should you make a purchase through a link, I may make a small commission. Your cost is the same. 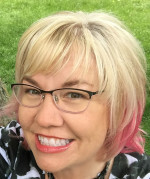 Using affiliate links allows me to continue providing high quality, original recipes tested in my kitchen along with other content I hope you find valuable, all provided at no cost to you. I am grateful for your support! Terrific! Love hearing this. 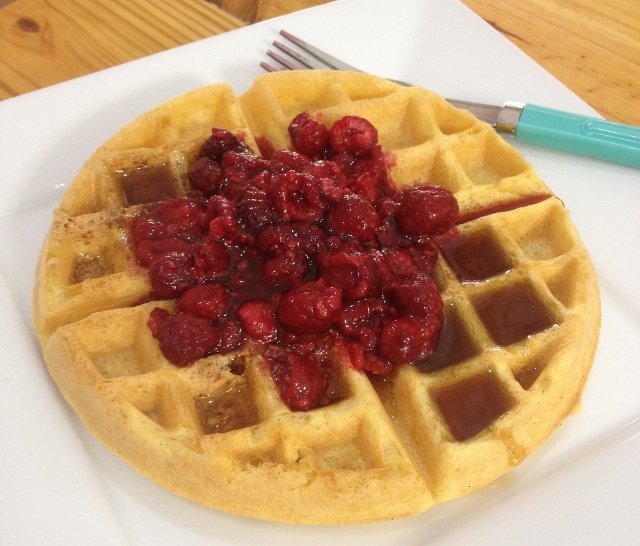 If you are a Brinner fan, you might enjoy the cornbread waffles I’m sharing later this week. They are great for dinner with veggie chili on top. These look great!! But I don’t have any guar gum. Anything else that I can substitute? When Kittie I were in Holland on one of or trips there we were taken to a city faire in some small town in Holland. They had these Belgium folks with sort of a gypsy type mobile units that came to the town once a year to make “Belgium Waffles”. Huge colorful circus type tents. I was a wonderful day. They were wonderful! Crunchy yet soft centers, my only complaint, no maple syrup, not a fan of stroop. My son-n-law and I ate quite a few. I’ll try your recipe and get back to you looks very tasty. What a lovely memory! I love the little city faires and traveling circuses we’ve happened upon in our travels. I hope you’ll give my recipe a go and report back! I’ve also heard that French Fries is an american term and they are really Belgium fries? When we were in Belgium, everyone referred to fries as frites, the same as what we heard them called in France. At a street fair in Belgium, I had frites with curry ketchup, mayonnaise and diced onions, served in a paper cone with a tiny plastic fork. I’ve got no words for how incredible those fries were. When we were in the Netherlands, we heard fries referred to as Flemish fries.